As a life long Viszla owner, my house has been filled with dogs most of my life, as many as four but no less than one. After breeding our female Tula back in 2005, we decided to keep two of her puppies, Panzer and Rusty. Tula eventually becamse diabetic, lost both her sight and vision, and ultimately we had to help her cross te rainbow bridge in April of 2017. She had been diagnosed with inoperable breast cancer, and she told us when it was time. We knew the day was coming when we had to let her go, our vet had said she had 4-6 weeks to live, and she last 7 weeks to the day. So it was expected, still hard, but expected. What was unexpected, however, was Rusty playing hard on a Saturday in July, his normal self, then six days later his kidneys failed and he was gone with no warned whatsoever. We were devastated. We had lost two of our family members in 3 months and we were heartbroken. Panzer would pace the house during the day looking for his brother, would scratch at the door of the garage until we let him in so he could see he wasn’t in there, then walking the entire fenceline, searching. My wife Leslie is a big believer in things happening for a reason, and ill let the reader be the judge of that. In April of 2018, almost a year to the day that Tula passed, Nichole reached out to us that she had a 6 year old male rescue, named Jack, who had never been in a house before, been in a car only once, and was not housebroken and had bit someone who tried to take his bowl away. We agreed to a 30 day fostering after passing our home inspection. Jax (jack) proceeded to hoist his leg on every kitchen appliance, have a couple of “Accidents” over the next week or so, and generally exhibited bad manners as the weeks went by. But…..he filled a hole in our hearts right away. From the first night he slept in the house, on our bed. For never having been in a house before, he sure figured out it was pretty nice to lay on a blanket on the couch! We were smitten by him, and I would called this a successful rescue. Four weeks after that, Nicole reached out again. She had a small female, named Ruby who was rescued from the same person who own Jax, was not quite 4 years old, weight 30 lbs, was skin and bones, never been in a house and so on. We took to this dainty princess from the very minute we got her, and she immediately fell in absolute love with Leslie. We are slowly getting her housebroken. For a dog who was never inside, she now hates to go outside! She is mortally terrified of thunder, shakes so hard her teeth rattle. Weve bought her medicated treats.a thunder shirt which helps, but she loves being wrapped in ablanket, and held by her person Leslie. We decided to call her Lucy instead of Ruby, because the irony is we would have two dogs that were named Jack Ruby and I didn’t want any Lee Harvey Oswald questions. 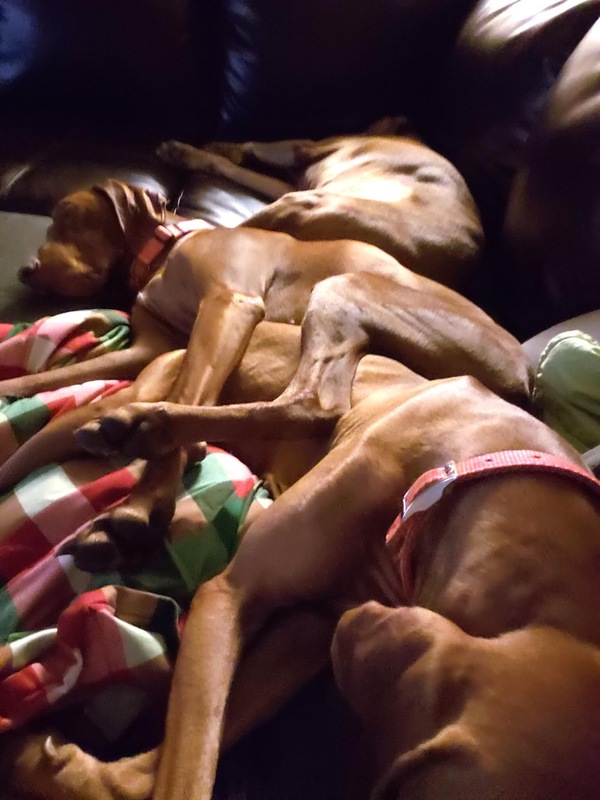 Lucy was definitely another successful rescue as you can see by her, Jax, and Panzer all laying together on the couch. The irony is this. 2017 we lost two family members in 3 months. In 2018 we gained two family members in three months. We got Jax on our wedding anniversary date, and Lucy and Leslie share the same birthday! This was very much a successful rescue……they rescued us.